SACRAMENTO, Calif.--(BUSINESS WIRE)--Propel Fuels, California’s leading low carbon fuel retailer, announces plans to launch an electric vehicle (EV) charging network to bring fast and affordable access across the state of California. 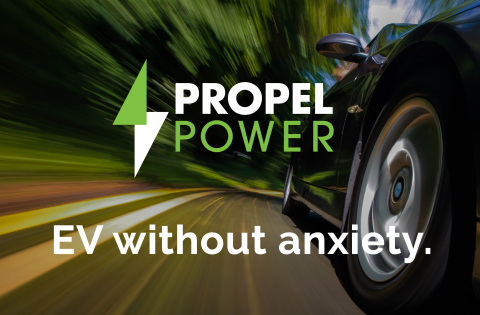 As millions of Californians transition to lower carbon transportation, Propel will begin testing its Propel Power network by Q4 of 2019, with broader roll-out targeted for 2020. Propel has deployed a proprietary, low-carbon retail platform throughout California. The platform enables data-powered insights into low carbon customer values, behaviors, and demographics. Innovation in customer experience, mobile communication, and retail technology have earned Propel the fueling industry’s most loyal customers, matching that of America's strongest consumer brands. Propel has made significant technology investments to support the Propel Power rollout including patented P:LOCAL™ site selection tools, CleanDrive® carbon tracking, and cloud-based network operations providing a robust platform for management. Propel was founded in 2004 with a mission to connect people to better fuels. Propel has pioneered clean fuel retail, leading the industry with unparalleled innovation in retail technology and customer experience. With retail locations across California, Propel provides new fuel choices that are higher in performance, deliver better value and create healthier communities. Propel ranked among 2015’s top 10 private companies in Silicon Valley and is recognized by Inc. Magazine’s “Inc. 500.” More information is available at propelfuels.com and by following Propel at facebook.com/propelfuels and on Twitter at @PropelFuels. Video testimonials from Propel customers are included in a video “A day at Propel.” More information, screenshots, B-Roll video and photography for download and use is available at: propelfuels.com/media_kit.